The number of earthquakes recorded close to Cuadrilla's fracking site since the controversial practice started two weeks ago has topped 30. The controversial practice, which involves injecting water, sand, and chemicals into rock at high pressure began off Preston New Road, Little Plumpton, on Monday, October 15. None of the tremors have caused any damage, Cuadrilla said, and none were felt at the surface. Six were noted by the British Geological Survey (BGS) yesterday, starting with the most powerful yet - 1.1 on the magnitude scale - at 11.30am. That led to fracking being paused for 18 hours under government regulations, with further movement recorded at 11.43am (-0.4) 11.44am (-0.2), 11.58am (0.0), 9.13pm (0.1), and 1.37am today (-0.3). The 31st earthquake was detected at 2.36pm today, and registered -0.5 on the magnitude scale. "This level is way below anything that can be felt at surface and a very long way from anything that would cause damage or harm," Cuadrilla said yesterday afternoon. Yesterday marked the second time the firm has been forced to halt operations following a 0.8 tremor on Friday, with the government saying fracking must paused whenever 'quakes over 0.5 happen. Cuadrilla, which also stopped voluntarily last week after an 'amber' 'quake measuring between 0.0 and 0.5, said a 0.8 tremor on Saturday didn't stop operations because fracking wasn't happening at the time. The county council's Labour group called on the government to suspend fracking, claiming "self-regulation does not appear to be reducing the size or frequency of these earthquakes." It also wants council boss Angie Ridgwell to write to Prime Minister Theresa May to call for an independent enquiry. Blackpool South MP Gordon Marsden said: "As the tremors increase, so does the distress and worry to local people. Government ministers need to get their heads out of the sand and urgently halt the fracking process. We need to find out what is going on below the surface at Preston New Road." Fracking was stopped at Cuadrilla's Preese Hall site near Blackpool in 2011 after earthquakes measuring 2.3 and 1.5. The BGS said almost 60 tremors were linked to fracking in the space of five months. If the seismic activity at Preston New Road continues at the same rate is has over the past two weeks, that number will be overtaken in just a fraction of the time, though none have been as powerful as 2.3 or 1.5. Cuadrilla drilled two exploratory horizontal wells into deep lying Bowland Shale rock after the government overturned Lancashire County Council's decision to reject the fracking site. It led to a round-the-clock presence by protesters at the site, with three campaigners recently jailed - and later released - for climbing aboard lorries heading for the site. The government's shale gas commissioner, Natascha Engel, who was appointed by Theresa May earlier this month, told a national newspaper fracking could help meet environmental targets, create tens of thousands of jobs, and meet Britain's energy needs for 50 years. Of the government's traffic light system, which has stopped fracking twice in two weeks, she said it is "far stricter than anywhere else in the world". She added: "The only other country as strict as we are has set the pause button at 1.5 because even that can hardly be felt on the surface." The firm said the process would take around three months to finish for both wells. It will then test the flow of natural gas, with initial results expected in the new year. 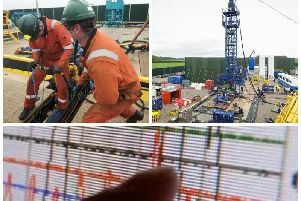 Lancashire For Shale said in a statement: "The fact the regulator is satisfied with Cuadrilla's ongoing well integrity checks and continues to allow fracking to proceed should also reassure people that the microseismicity we're seeing is not compromising any of the environmental protections that are in place. "It's worth reflecting on the fact that quarry blasting operations, which occur much closer to the surface and therefore nearer to properties and infrastructure, produce much more noticeable ground motion effects and are subject to much higher regulatory limits than shale gas extraction, but are generally tolerated by their host communities." The BGS said 58 earthquakes were linked to fracking at Preese Hall between March 31 and August 30, 2011, and said "nearly all of these [were] either during or within a few hours of fracturing operations". It said a study found that "the earthquake activity was caused by fluid injection directly into a nearby fault zone, which reduced the effective normal stress on the fault and caused it to fail repeatedly in a series of small earthquakes". It said a "possible causative fault was later identified" following a detailed 3D "seismic reflection study".